I spent much of my childhood listening to the sound of striving…the sound of people trying became the soundtrack of my life. Dr. Martin Luther King, Jr., civil rights leader extraordinaire, winner of the Nobel Peace Prize, an inspiration to millions and to generations, was assassinated 50 years ago this spring. Today, Martin Luther King, Jr. Day, honors his courageous leadership and practical, spiritually-grounded activism on behalf of the oppressed. Michelle Obama, born 54 years ago last week, carried on much of Dr. King’s legacy as First Lady extraordinaire. She describes her journey from poverty on the South Side of Chicago to the White House and beyond in her completely inspiring and completely readable memoir, Becoming. 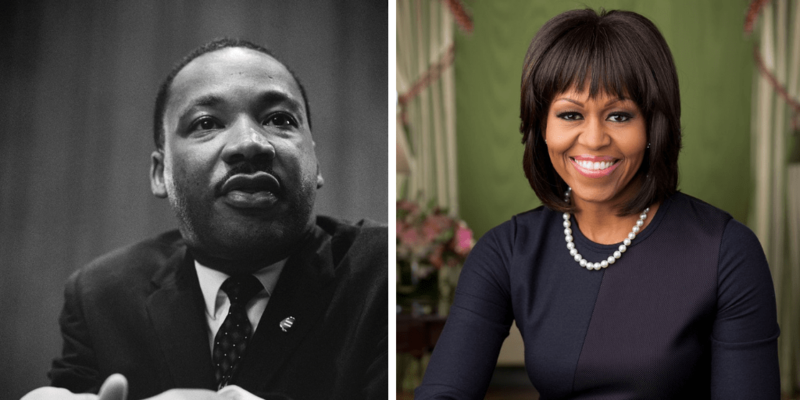 Both Dr. King and Michelle Obama embodied one of the most essential factors of resilience – realistic optimism. Realistic optimism is the foundational factor in training resilience, according to the scientists/authors of Resilience: The Science of Mastering Life’s Greatest Challenges. Optimism is “a future-oriented attitude, involving hope and confidence.” Not blind, “rosy” optimism that would underestimate risk, overestimate ability and lead to inadequate preparation. The researchers of this Resilience, Steven Southwick, M.D. and Dennis Charney, M.D., found that realistic optimists rarely ignore the negative in life. They pay close attention to negative information that is relevant to the problems they face. But, unlike pessimists, they do not remain focused on the negative. They tend to disengage rapidly from problems that appear to be unsolvable. They cut their losses and turn their attention to problems that they believe they can solve. One of the ways these researchers suggest for cultivating realistic optimism is based on Barbara Fredrickson’s “broaden-and-build” model. People who experience positive emotions (kindness, gratitude, joy, etc.) experience an accompanying broadening of their attention and their behaviors. Their thinking tends to become more creative, inclusive, flexible and integrative. They can look at stressful situations from multiple perspectives, contributing to psychological resilience. Remember that these difficulties won’t last forever. Take one day at a time. Where now there may only be pain, expect that over time good things will return. Keep the adverse event or situation within its limits; don’t let it pervade other areas of your life. Notice what is good, i.e. acts of kindness by those who recognize your struggle. Realistic optimism promotes the kind of active striving epitomized by Martin Luther King, Jr., and Michelle Obama and, with practice, by us.